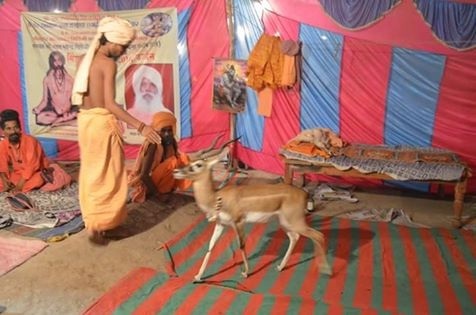 Renowned photographer Balu Mondhe clicked this photo of sadhus with a blackbuck at Ujjain and posted it on facebook to illustrate the spirit of Simhastha 2016. When asked whether or not domestication of black buck is permitted under the Wildlife Protection Act? former Madhy Pradesh principal Chief Conservator of Forest Ramesh Dave said: “No it is not.” Let’s hope someone wakes up to it, he added. Madhya Pradesh Principal Chief Conservator of Forest Narendra Kumar also shared his concern on this count. Wildlife expert and former Additional Principal Chief Conservator of Forest (Wildlife) Suhas Kumar pointed out that black buck is a schedule I animal under the Wildlife Protection Act. Any one who possesses or keeps in custody any live scheduled animal or a trophy derived from such animal must have an ownership certificate issued by the Chief Wildlife warden. He expressed the hope that the Local forest officers having jurisdiction must have checked whether the person possessing this sub-adult blackbuck has a valid Ownership Certificate or not. As far as I know, Mr. Kumar said pointing out except for domesticated elephants not a single ownership certificate has been issued by the Madhya Pradesh Chief Wildlife Warden for any other scheduled species . I do not know about other states. As far as demonstration of legally possessed scheduled animal is concerned the Supreme court has banned training and performances by lion, Tiger, leopard, sloth bear and monkeys. A person in possession of a scheduled animal on the basis of a valid ownership certificate must ensure the well being of the animal. If the animal so possessed is found to be mistreated in any way , the possessor a may be tried under the prevention of cruelty to animal ACT and his ownership certificate may be revoked. Giving is reaction, Bobbie Jamwal (Kanwar K.S. Jamwal), an expert wildlifer and Managing Director at Quest said:The trouble is “a combine of Religion and Politics is the Law in India”. My question is will that Garland on the neck of the Chinkara ensure its survival. Wild animals in the “Schedule 1” of the Wildlife Protection Act have been accorded the highest protection. Trade in any such scheduled animals is completely banned, so is hunting or even transporting but using them as mascots or for religious purposes and not being questioned has the blessing of The Powers that Be (TPTB).